Product prices and availability are accurate as of 2019-04-09 19:22:32 EDT and are subject to change. Any price and availability information displayed on http://www.amazon.com/ at the time of purchase will apply to the purchase of this product. 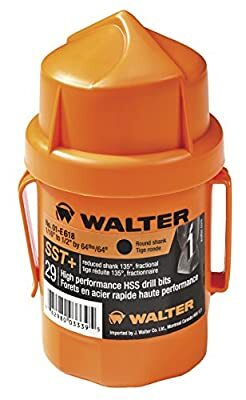 The 29-Piece Jobber's Length Bit set by Walter Surface Technologies is manufactured with a cobalt blend to ensure longer lifespan of the tool and more holes with each bit. 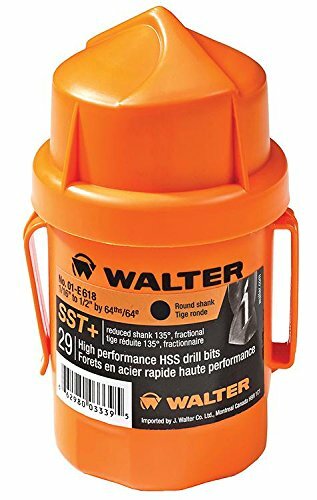 All the round shank drill bits in this set are ideal to be used for drilling through round surfaces. Drilling smoothly through steel, stainless steel, non-ferrous, and non-ferrous metals, the jobber length bit can also be used for drilling with stationary machines. The set comes neatly packed in a sturdy shock resistant box and the sizes of all the HSS tools are clearly marked on inside panels for easy identification and selection.